Dr. Nensa: Cardiac positron emission tomography (PET)/magnetic resonance imaging (MRI) with fluorine 18 fluorodeoxyglucose (FDG) turned out to be feasible with an integrated whole-body 3-Tesla PET/MRI system. Despite the presence of a PET detector in the magnetic field of the MR imaging unit, high-quality cardiac MR images were acquired. PET images originating from a PET/CT and the PET/MR scanner showed very good visual agreement and no statistical significant difference of the mean was found in standardized uptake values, however, variance was considerable. In patients with myocardial infarction, PET and MR images were in good concordance regarding both, cine imaging and late gadolinium-enhanced imaging. 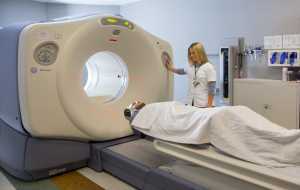 SEATTLE – For the first time, researchers at Seattle Cancer Care Alliance have demonstrated the feasibility of using serial positron emission tomography (PET) scans, using a special estrogen-containing isotope, to confirm the relative effectiveness of estrogen-blocking and estrogen-depleting therapy in patients with metastatic breast cancer. The results of the research are published online in Clinical Cancer Research. While the results were expected they had never before been proven, according to corresponding author Hannah Linden, M.D., a breast oncologist at SCCA and an associate professor of Medicine at the University of Washington School of Medicine. “What we’re suggesting in the paper — that we couldn’t fully test for before — is if estrogen is incompletely blocked you’re not getting a good outcome for the patient,” Linden said. The isotope was manufactured by the chemistry group at the UW as part of the UW Nuclear medicine program project grant. Key collaborators in the study include David Mankoff, M.D., Jeanne Link, M.D., and Kenneth Krohn, M.D., at the SCCA, and UW, and Brenda Kurland, a statistician at Fred Hutchinson Cancer Research Center. . Grants to Linden, Mankoff and Krohn from The National Institutes of Health and the Mary Kay Ash Foundation funded the study.